The polarity arises from the inability (refusal?) to see the intimate connection between the two poles. In fact they are two aspects of a single reality. All other polarities spring from this source. From a Christian perspective, this polarity is the fruit of the Tree of Knowledge. It is the inevitable distinction between the Knower and the Known. The Christian resolution to the polarity appears primarily in the two great commandments “Love they neighbor as thyself” and ‘Love God with all your Mind and Spirit”. The first describes the intimacy of the connection between Me and Not Me. The second points to the unseen connection between them. Fredrick Buechner says that there are two kinds of laws. The first is established and enforced by an authority whereas the second is a statement of how reality works. Violate the former, and if you are caught by the authority, you are liable for punishment by that authority. The consequences associated with ignoring the second type of law are implicit in the law itself. The law of gravity is an example of the second type of law. Ignore the law of gravity, by say stepping off a cliff and there is no issue of being caught, no issue of punishment, the law merely acts. I see the two great Christian commandments as this second type of law. 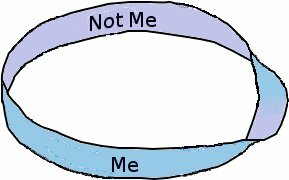 In fact I see the both laws as a reflection of the connection between “Me” and “Not Me”, between “Self” and “Other”. Love yourself and you automatically love the other because they are one at an unseen level. Love God and you automatically love yourself and your neighbor.